I havent posted here in AGESSSS, and I'm sorry. before: one of my favourite pants, but alas... i am a big girl now. it is too short and no longer zips up! [censored because my undies was showing] its a light material, dont know what it's called though. there are neat seam lines running up the leg, which i loved. 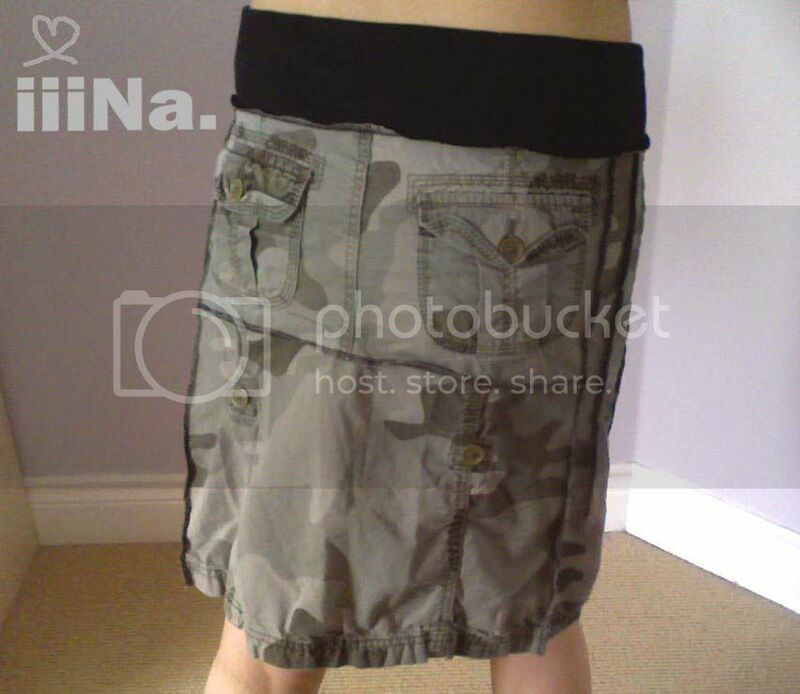 after: cut off the top half of the pants and worked soley with the leg-part of the pants. sewed everything together and since the pants were fitted, it SURPRISINGLY also fit amazingly waist and hip curves! 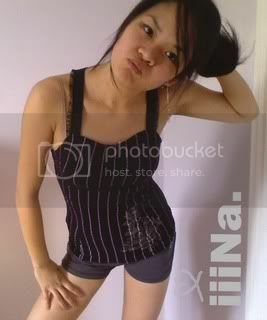 at the bottom of the pants, it had decorative lace, i took advantage of that and used it to tie straps. 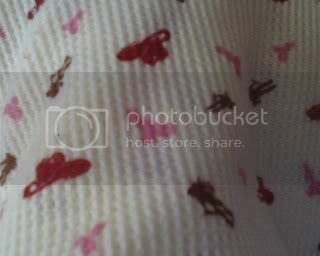 this shirt is only 1 strap though, but its with super cute cowboy fabric i got in the remnant bin! the strap is adjustable too! hence the little peice hanging off. the top and bottom ends of the shirt are just serged. 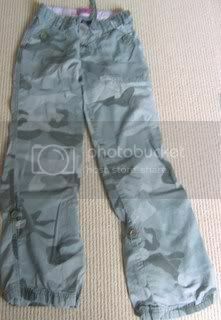 before: my little sister's camo pants. she's at the age where they go through a pair of pants a month. GEEZ growth spurt! slooow downn! its annoying for my mom, but its okay- because i get more clothes to cut up! after: my parents recently bought me a brand new serger as a first-year-of-university-grad-present! WOOHOO. i never get grad presents, but i guess it all paid off i had so much fun with the serger on this project (you can tell right? ) i dont know what else to say about it. i cut out a bunch of rectangles, triangles and serged it all together! 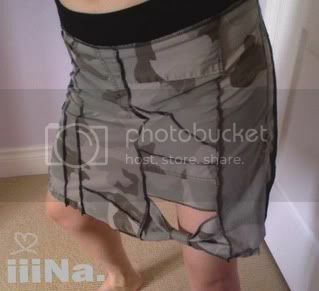 then added a peice of black fabric waistband. i added a pocket from the original pants on the right hand side, a bow on the bottom left. and the back pockets of the original pants were saved! 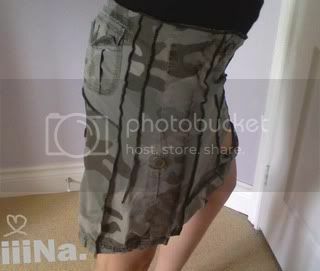 the skirt is about knee-length but its pretty big around the waist for me though, so im trying to find it a new home! after: BUT HAVE NO FEAR! i gave it a better, more fulfilling life cut it at 2/3 from the top to make the bust. 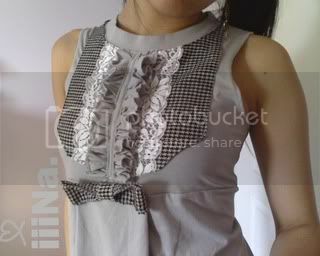 added houndstooth yolk/bib (ONSALE! regular: 29.99 a meter, now 5$!!) then decorated with lace and some scraps of gray. woohoo. its so super comfy. i couldnt stop dancing/ taking pics of it. 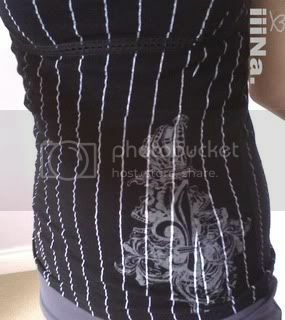 after: took in the sides to make it more flattering, added straps with my favourite kind of lace. 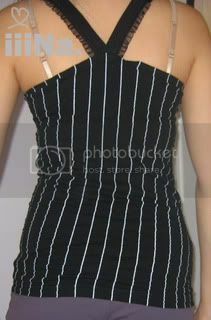 straps go to a V in the back.. then i added lace/ribbon to contour bottom of bust. 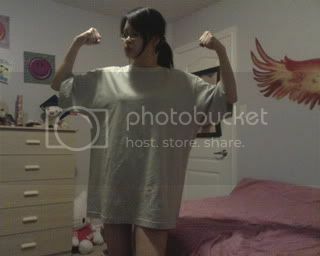 before: little sister's shirt that she barely wore. 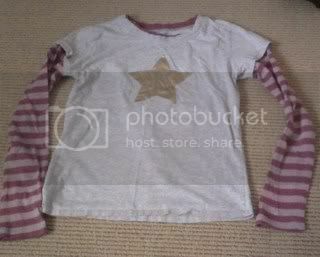 the focus is a golden coloured star on gray tshirt fabric. sleeves are pink stripes! ahhh, an amazing start to summer <3 it feels good to be back and sewing. That dress is so so cute! You did a great job with those recons. I loved seeing them. These are great! I love the shirts and that skirt is too cute! I'd totally buy some of these if I saw them in the store. Totally amazed by the t-shirt to dress. something so sweet from something so.... square! "Start every week with a break-neck urgent design" - Alanis Morissette: Purgatorying. 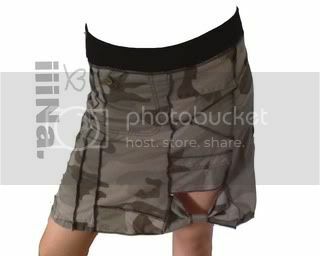 I really like the camo skirt, pinstripe tank, and star tank. Those are pretty cool. I am up for a personal swap! I love the dress and the skirt ! See something you like? Check out my shop! So the yoke was a separate piece? haha now I want something like thisss!